The interior of the club was once an old ale house located in the Sussex county of England. In the early 1900s, the ale house was carefully disassembled and shipped to Chicago. It was then reconstructed atop the Bell Building, one of the first office towers owned by Herbert Bell. 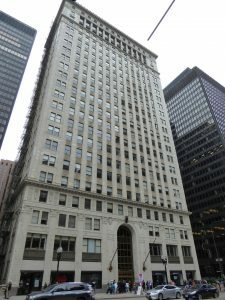 In 1956, the building was purchased by the Old Republic Insurance Company and was renamed the Old Republic Building. Many of the paintings and furnishings from the old ale house are still an integral part of the club today. The skyscraper itself is now certified as a Chicago landmark. Sitting near the Chicago River, the Sky-Line Club offers luxurious views of the city. Its rooftop terrace, for instance, overlooks the Magnificent Mile on Michigan Avenue. Because of its spectacular scenery, the club is often rented out for weddings and other special occasions. 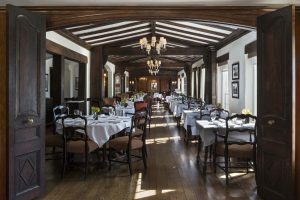 Breakfast and lunch are available exclusively for members and the club also hosts private dinner parties. Space is limited to 300 members at a time, so admittance is highly coveted among socialites.